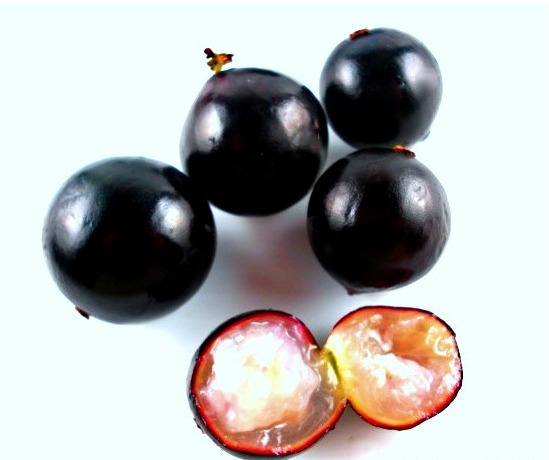 Jaboticaba is widely cultivated in domestic orchards of South Eastern Brazil since the colonial era. Most people consider it to be a native of Brazil. But this has still not been confirmed as till now it has not been found in nature. All the plant descriptions are from cultivated specimens. 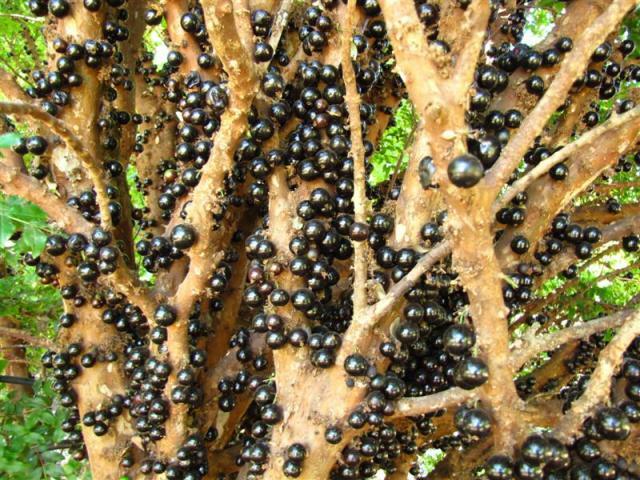 Jaboticaba has some unusual features. Its fruit tastes like grape. The fruit is produced right on the bark of the tree on up and don of branches. So it creates a very unusual sight. The flowering in jaboticaba is also unusual and interesting because of his feature. A small, bushy tree or large shrub from 5-10 m high, with fine-textured evergreen foliage and multicolored bark. Leaves, lanceolate to elliptic, 2.5 to 5 cmlond, dark green and somewhat leathery. Flowers, small, white, produced in profusion, singly or in clusters, directly on the bark, all along the trunk, limbs and larger branches several times a year. 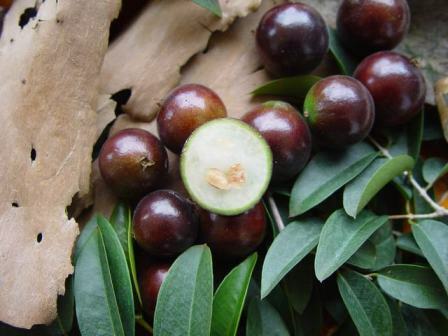 Fruit, grapelike in appearance but with a thicker and tougher dark maroon-purple, almost black skin; fruit produced directly upon the trunk and larger branches, singly or in clusters from the ground up, 1.5 – 4.0 cm in diameter; pulp whitish and gelatinous; flavour subacid, pleasant and grape like; skin flavor slightly turpentine like but agreeable. The fruits are eaten fresh and are good to eat. These can also be made into jellies and jams. Wine is also made from jaboticaba fruits in Brazil. *Analyses made in 1955 at the Laboratories FIM de Nutricion, Havana, Cuba. 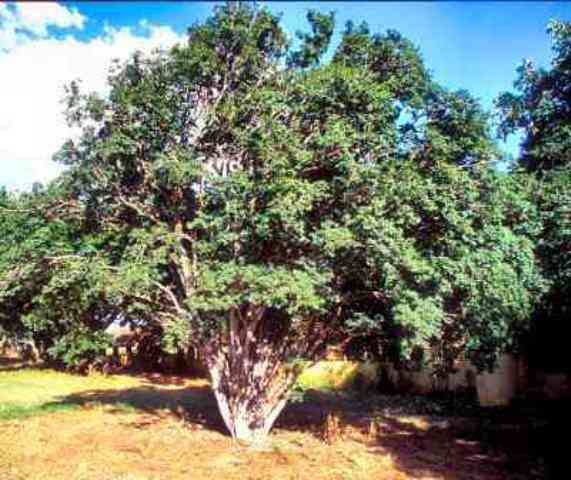 **Others have shown 30.7 mg.
Jaboticaba trees are mostly raised by seed. The seeds are polyembryonic each seed giving rise to 3-4 seedlings. Some varieties have also developed and the plants of named varieties are propagated by inarching and air layering. Budding is difficult in case of this fruit due as the bark is too thin. The plants are slow growing and take 6-7 years for coming into bearing. Trees are planted at a distance of 7-9 metres. 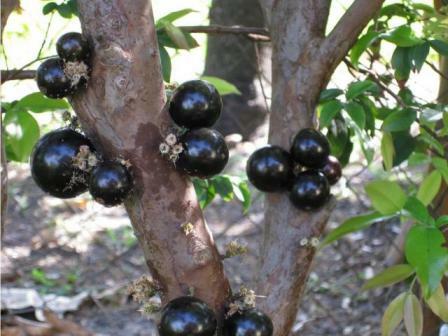 Besides being a good fruit, jaboticaba is a very attractive plant with good landscape value. It should therefore be promoted as a new commercial fruit crop all over the world.